Thanksgiving is behind us already. Can you believe it? I certainly cannot. You know what that means, right? Only a few more weeks to finish your holiday shopping. 4 more weeks of fabulous holiday music. 3 more weeks until we cannot stand the sound of holiday music. 6 months until my wedding. Wasn’t it just summer … yesterday? Didn't I just graduate college ... last week? Time sure flies when you’re having fun. You know what else is coming up? Lots of pigs in blankets and cookies in the shape of Christmas trees. Lots of holiday meals with lots of butter and salt and sugar. Bring it on … ‘tis the season! I have a suggestion, though. How about during your “off” days when you have no party to attend and you are relaxing at home with your husband, boyfriend, cat, daughter, son, roommate, who have you, take a break from the holiday feasting. Have a detox day (or two). You know those. They usually fall the day after you ate one too many pieces of pie and drank one too many candy cane martinis. You swear off overindulgance for life … or at least until the next party. 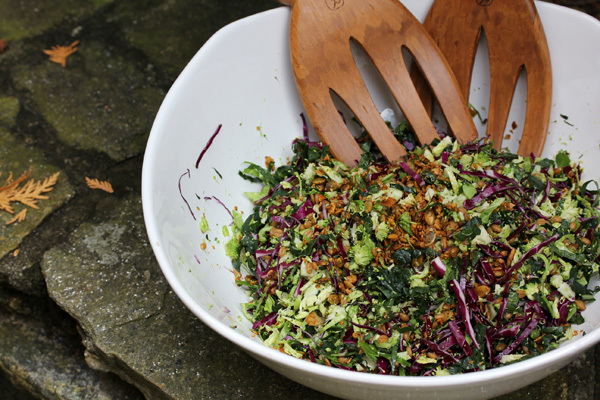 And on those detox days, eat this salad. Or better yet, eat this salad all the time. You're going to want to. 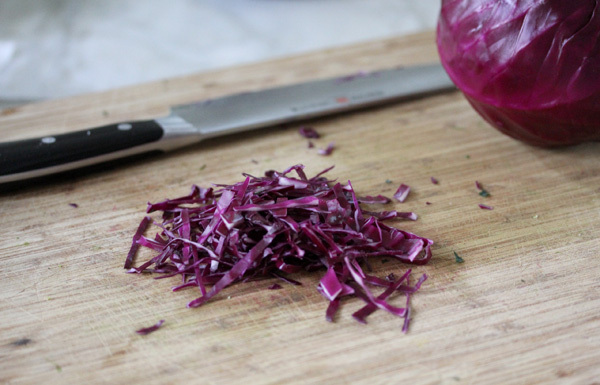 This salad has incredible detox properties and it is jam packed with vitamins and minerals. Eating kale, broccoli, cabbage, and brussels sprouts raw means you'll reap the additional nutritional benefits from these fabulous veggies. Raw almost always means more nutritional bang for your buck. This salad will give you that little extra boost that everyone can use this time of year. It might even help keep you sane when you're doing last minute shopping in a crowded mall, but don't hold me to that ;). Optional add-ins: wheat berries, quinoa, raisins, cranberries, etc. Place the seeds on a baking sheet lined with parchment. Toss the pumpkin seeds with the olive oil, salt, pepper, and cayenne (if you’re using) and spread them out evenly across the pan. Place the seeds in the oven and cook for 20 minutes. Remove and allow them to cool. In a bowl, whisk together the mustards, balsamic, and lemon juice. Then, slowly drizzle in the olive oil and whisk until it is emulsified. Give it a taste and season with salt and pepper accordingly. Set aside until your salad is ready. Chop all of your ingredients and place them in a large salad bowl along with the currants. 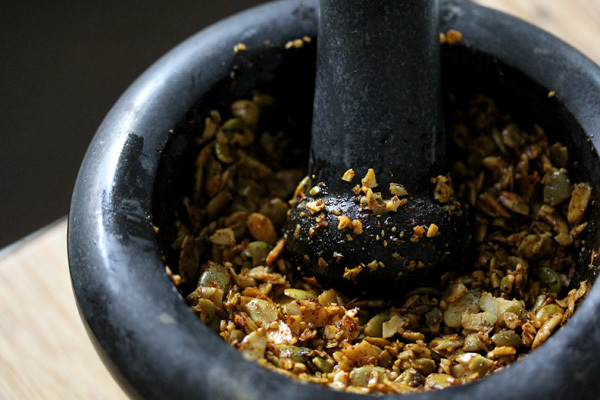 Using a mortar and pestle, mash the pumpkin seeds. Toss the pumpkin seeds in with your salad. Pour the dressing over the salad and toss really well to combine. Taste and adjust to your liking. Sometime I add a splash more vinegar, olive oil, or fresh cracked pepper depending on the taste. Eat immediately after adding the dressing.